For the past couple of months I have been working day and night on a piece for 5-12 laptops and I am extremely happy to report it is almost finished. The work was written for the Electric Monster Laptop Ensemble founded and directed by Hsiao-Lan Wang and will be premiered later this spring. I am extremely excited about this piece which uses live sound from mysterious sound-making objects, BSOs (Bouncing Spherical Objects). The live sound from the BSO soloists is processed, manipulated, and passed around a WiFi network via Max/Msp. 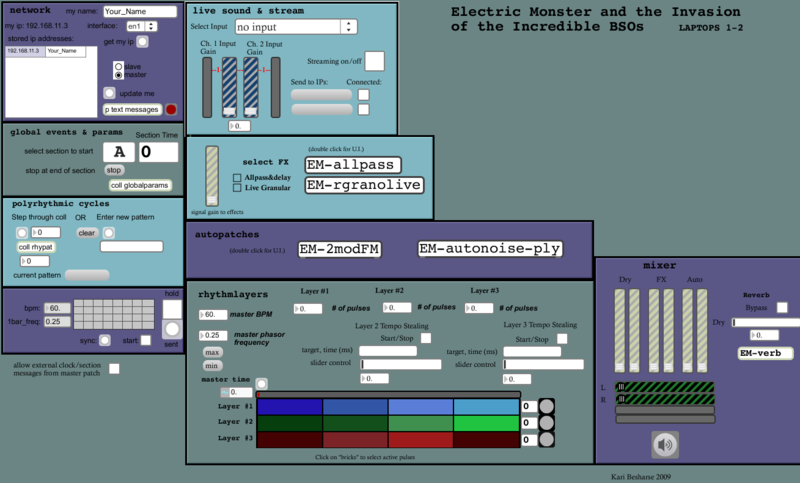 Categories: Laptop Ensemble, Max/Msp | Tags: Laptop Ensemble, Max/Msp | Permalink.